Imagine having a garden, but not being able to feed your family. ​Imagine digging into the sand of a dry river bed in search of drinking water. Imagine your child is diagnosed with stunted growth, a preventable early childhood condition with lifelong consequences. 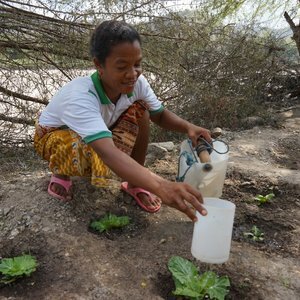 These are the struggles of the people living in a small village in West Timor, Indonesia. On the bank of an impassable river in monsoon season, which transforms into scorched moonscape at rains’ end, the small village of Oebaki is considered one of the poorest communities in the country. The prefix “Oe” means water, but drought has stolen this town’s identity. Poverty abounds, and families struggle to feed their children. (Ephesians 3:20). Your gifts to Week of Compassion help make this world look more like the world God imagines. In Oebaki, your gifts help support well-trained savings and loan groups that allow families to buy resilient vegetable seeds for farming, yarn for weaving stunningly beautiful traditional fabric, and egg-laying chickens for a sustainable source of protein essential to prevent child stunting. These three enterprises also produce excess goods that families sell to generate income. Those who once struggled during the dry season and drought can now maintain a diversified diet by eating stored root vegetables from the last harvest, supplemented with greens purchased at the market. That’s what happens when we imagine the world as God intends. Through your gifts to Week of Compassion, our imaginations, and far more, become reality for families in Oebaki and around the world. Please give generously! We continue to pray for the communities in California affected by the current, deadly wildfires. On Sunday, First Christian Church, Paradise worshipped at First Christian Church, Chico, as Paradise was, and is, under evacuation orders. Pastor Jan McCollester, of First Christian Church, Paradise shared with Week of Compassion staff today that the church building, which was thought to have burned, appears sound, according to reports from firef...ighters in the area. However, most, if not all of the members of the congregation expect damage to or total loss of their homes. First Christian Church, Chico also has members whose homes have burned. As of 7:30am local time, the Camp Fire had burned over 125,000 acres and was 30% contained. In Southern California, the Woolsey fire has burned nearly 100,000 acres and is 35% contained. Gifts to Week of Compassion can be designated "US Storms and Fires" to support response and recovery efforts for these damaging fires. O God, in the midst of more heartache, chaos, and loss, we turn to you questioning how many times our hearts must break. They break for our siblings who have lost their homes, their livelihoods, and their community. They break for those who mourn loved ones lost in the flames. God, our hearts break for your earth, which you created good, but which we have marred by our mistreatment. Our hearts break with yours, for your beloveds who are suffering today. And yet, in the midst of the brokenness, we glimpse your new creation--in churches that open for their neighbors, in strangers who give generously to help others in a moment of need, in firefighters and first responders who demonstrate sacrificial love and bravery. So, even from our brokenness, even from the pit, we shall praise you, for your steadfast love endures. Amen. Pray for the affected communities and the trained first responders and relief workers who are providing immediate relief. Stay where you are for now—these communities will need outside volunteers for the long process of rebuilding, but in these early days, volunteers who are not specifically trained and directly invited are more of a hassle than a help for local communities. This is especially true in North Carolina, where flooding continues, some rivers are still rising, and many places are under restricted access. Mark your calendars to come as a volunteer 6 months or a year from now. Follow Week of Compassion and Disciples Volunteering on social media to stay up to date on future volunteer opportunities through Disciples. In the meantime, there are many communities recovering from other disasters who are in need of your help right now! Visit www.discipleshomemissions.org/servants-needed to find out more. 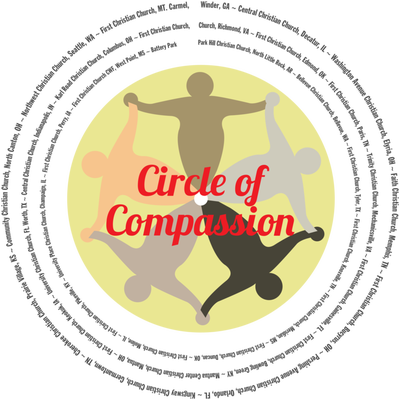 Give monetary donations to Week of Compassion. It may feel less personal than sending items you’ve lovingly selected, but money is easy to transport and is very efficient! Community organizations can often purchase supplies in bulk and at specially negotiated rates, and they can buy exactly what they need when they need it. Cash doesn’t take up warehouse space, and it can meet a variety of needs. Your dollars could become a meal at a shelter today or a new roof on a damaged house in a few months. On July 19, an outbreak of tornadoes surprised towns across Iowa. Though storms and tornadoes are common in the area, these were unusual, developing quickly on an otherwise clear day. Bondurant Christian Church and Central Christian Church Marshalltown were both mere blocks from areas of severe damage. Both churches have responded with deep compassion, offering care for affected church members and opening their doors to their communities. Bondurant Christian Church has opened... its building as a cooling center and is welcoming residents who lost their homes to use the church kitchen while they are staying in hotels. Central Christian Church has similarly opened their building to local organizations. According to Rev. Diana Frieberg, pastor at CCC: "We are currently opening our building now as a drop in site for anybody that needs a place to cool off, use internet or relax. We have also invited Northeast Iowa Agency for Aging to use our site for coordination of their senior meals, and The Triumph Center to use our site as a daily drop in place for peer to peer interactions for the clients with mental health issues." In both communities, discussions are underway for long-term recovery, as well. Week of Compassion is grateful to be in partnership with these congregations to help provide relief now and support for the recovery to come. Received in most congregations on May 20 and 27. ​Disciples are on course to starting 1,000 new churches by 2020. For additional information visit www.hopepmt.org. The Week of Compassion website states that it is the relief, refugee and development mission fund of the Christian Church (Disciples of Christ) in the United States and Canada. Week of Compassion seeks to equip and empower disciples to alleviate the suffering of others through disaster response, humanitarian aid, sustainable development and the promotion of mission opportunities. their futures, they imagine themselves as small business owners, artists, mothers, surgeons, and pilots. The human imagination is also limited, bound by our finite human experience. Sometimes the suffering of the world outpaces our ability to imagine new life. For many, 2017 was an apocalyptic year filled with unbelievable storms, earthquakes, fires, floods, and violence. We prayed, stood with, and gave to people and causes from next-door neighbors to global neighbors we will never meet. Even when we found it hard to envision recovery and new life, we accompanied our neighbors, strengthened by the assurance that God is working in, through, and beyond us. world, around the year” to bring more of God’s love and goodwill than we can ask or imagine. You shared your compassion with families in South Texas and Puerto Rico who were impacted by hurricanes. You offered food and shelter to families as far away as Sierra Leone and Bangladesh who experienced the most severe floods of the century. You extended God’s care to refugees from Syria and Somalia. You imagined an unimaginable world -- God’s world-- for empowered women and girls in the Democratic Republic of Congo and Indonesia. As Week of Compassion staff have traveled in Puerto Rico and the US Virgin Islands, visiting with communities affected by hurricanes Irma and Maria, we have heard these time markers from friends, partners, and strangers. In the midst of conversations about setting up volunteer housing or procuring building materials--93 days. Over a dinner of plantains (imported, since few plantains survived the storms)--68 days. They signify the number of days people have been without power. In Puerto Rico, the power grid is operating at 70% capacity, and the first priorities for power restoration were public services, like schools and hospitals, and commercial customers, like grocery stores and hotels. Thousands of residences are still without power. Similarly, in the US Virgin Islands, territory-wide power restoration was only at 60% as of last Friday. Today, Thursday, Dec. 21 marks 106 days without power for many who lost electricity during Hurricane Irma. As we discussed logistics and long-term plans, these counts were reminders of the humanity at the core of our work. The shipments of lanterns are not about pallets and ports, but about people. The counts served, too, as concrete evidence that the frustration and exhaustion our friends experience is warranted, and is born out of struggle, heartache, and loss. The number of days without power became a signifier of the pain of waiting and also of the resilience of people who continue to serve one another in love, even as they begin their days with cold baths in unlit houses. This season of Advent is, itself, another signifier of humanity, of struggle, of longing for restoration. During this time, we move into the darkness of the world. Days grow shorter and dark nights longer. Yet, through the stories of our faith and the traditions of the season, we also enter into the darkness of the womb, in which the Spirit dwelt, and into the holy space of a stable dark, where the Word was made flesh. "In the womb, in the night, in the dreaming; when we are lost, when our world has come undone, when we cannot see the next step on the path; in all the darkness that attends our life, whether hopeful darkness or horrendous, God meets us. God's first priority is not to do away with the dark but to be present to us in it. I will give you the treasures of darkness, God says in Isaiah 45:3, and riches hidden in secret places. For the christ who was born two millennia ago, for the christ who seeks to be born in us this day, the darkness is where incarnation begins. Can we imagine the darkness as a place where God meets us-and not only meets us, but asks to take form in this world through us?" On this longest night of the year, we await--again--the birth of Christ among us. In this night of darkness, we give thanks for the ways God has taken on flesh through our brothers and sisters in Puerto Rico and the US Virgin Islands and through your gifts to Week of Compassion. ​This organization relies on your compassion, your gifts and your commitment to help change lives for the better. We do so in the name of Jesus Christ and on behalf of the Christian Church (Disciples of Christ). Week of Compassion, through its partnerships, will respond to human needs around the world. ​Disciples bring hope to situations of natural disaster, war and famine, more efficiently than ever before thanks to the faithful gifts of local congregations. With your continued support, Week of Compassion will remain responsive to Christ's call to both short term relief and long term partnerships in order to empower our brothers and sisters around the world. ​the impact these donations make, and to donate!